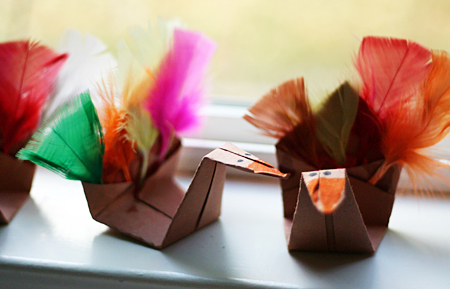 If you have some brown paper and colorful leaves than you have a fabulous Thanksgiving craft for kids. my decorated an origami swan with some feathers and voila! You have an origami turkey. You can see the origami turkeys over at Let's Explore and see a photo tutorial on how to make an origami swan over at Marcel's Kids Crafts.